A newly discovered species of parasitic wasp has one of the most brutal and Machiavellian ways of securing resources. The wasp targets social spiders that live in colonies in the Ecuadorian Amazon, which it infects with larvae that hijack the arachnid’s brains. The spiders are no longer in control, virtually turning into zombies whose only purpose is to do the wasp’s bidding. Adult Zatypota wasp. Credit: University of British Columbia. By far the greater number of wasps (over 100,000 species) are parasitoids which lay their eggs in or on the caterpillars of other insect species. This makes them excellent pest controls and farmers love them because they do little to no damage to crops. In fact, some farmers actually buy parasitic wasps to control insects in their fields. However, some wasps have taken their freeloading role to a whole new level of gruesomeness. For instance, gall wasps (Bassettia pallida) drill tiny holes in oak trees to eat them from the inside-out. The wasps also use these tunnels, known as ‘crypts’, as shelter and as hatcheries. When the young gall wasps are ready, they will munch through the woody stems and emerge as adults. Another type of wasp, known as Euderus, caught on to this behavior and will lay eggs in these holes, even if they’re occupied by developing gall wasps. In fact, that’s the idea. Once they hatch, the Euderus wasps will chew their way to freedom, eating through the poor gall wasp and emerging through its head! The gall wasp can’t escape because the hole is only big enough to support a developing gall and Euderus wasp, but not big enough to leave room for the gall wasp’s head to emerge. The emerald jewel wasp’s strategy, on the other hand, involves “zombifying” cockroaches and injecting them with larvae. The infected cockroach starts grooming extensively, loses its survival instinct and normal responses, and becomes an unwilling host and breakfast for the wasp’s offspring. The offspring wasp will eat the cockroach’s organs in a way that makes the insect stay alive longer, increasing the odds of survival for the offspring. This behavior is rampant that cockroaches had to adapt by using “karate kicks” to protect themselves against the gruesome intruder. 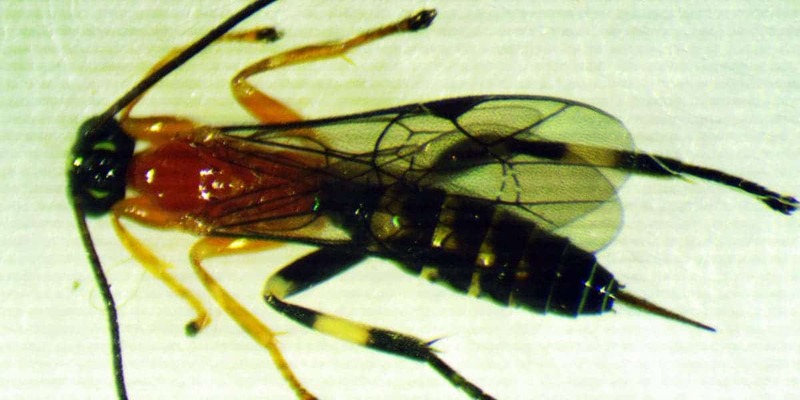 Researchers at the University of British Columbia have recently discovered another zombifying wasp while surveying the rainforests of Ecuador. The wasp targets one of only about 25 species of social spiders known in the world. Anelosimus eximius spiders live together in large colonies, where they hunt together and share parental duties. These spiders will rarely stray from their basket-shaped nests — unless they’ve come across the Zatypota wasp. Philippe Fernandez-Fournier, a former graduate student at the University of British Columbia and lead author of the new study, was puzzled by the strange behavior of some A. eximius spiders, which he saw wandering a couple feet away from the nest. The individuals would spin enclosed webs of dense silk and bits of foliage, known as “cocoon webs”. When some of these structures were collected and examined in the lab, much to everyone’s surprise, the researchers found that these were encasing a wasp. Female wasps first lay an egg on the abdomen of the spider, whose larva hatches and then attaches itself to the host. The larva feeds on the spider’s blood-like haemolymph while it is slowly taking over the spider’s body. At some point, the zombified individual starts leaving the colony and spins a cocoon for the larva. After consuming whatever nutrients the spider has left, the larva enters the cocoon fashioned by its arachnid slave, emerging fully developed up to 11 days later. The researchers believe that the wasps inject the spiders with hormones that make them believe they’re in a different life-stage or cause them to disperse from the colony. In the future, the researchers plan on returning to Ecuador where they want to further study the same spider colonies and parasitic wasps.